Peter H. Reynolds is a New York Times bestselling author and illustrator of many books for children, including The Dot, Ish, and Happy Dreamer. His books have been translated into over twenty-five languages around the globe and are celebrated worldwide. His books capture the heart of his mission, to encourage people to be brave, to create, to collaborate, to problem solve. In addition to his own books, he has collaborated as illustrator with many other authors, including Amy Krouse Rosenthal, Megan McDonald, Allison McGhee, and Susan Verde. Read more about Peter at www.peterhreynolds.com. Peter opened his bookstore in Dedham in 2003 to fix a glaring problem: there was no bookshop in his hometown! 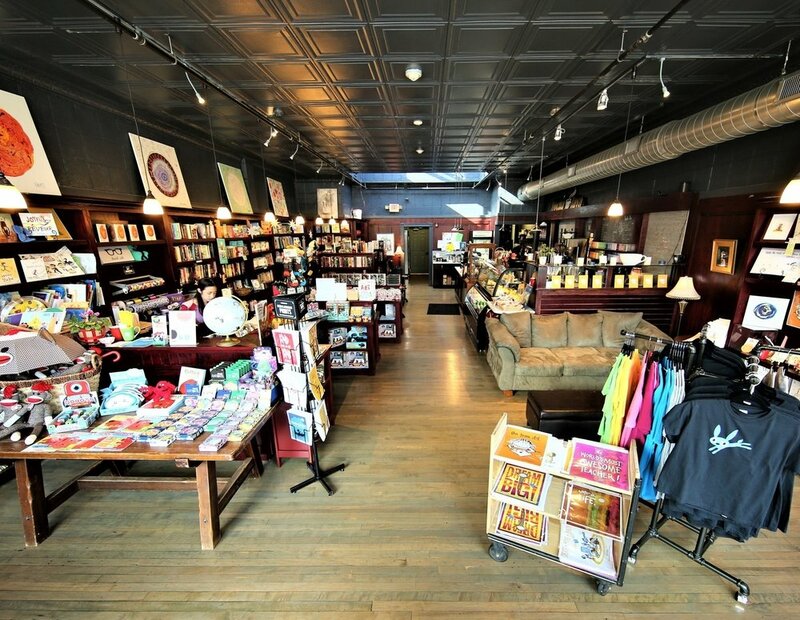 The shop, packed with books, toys, games, and art supplies, was originally only 800 square feet and called The Blue Bunny after local famed Dedham pottery. Eventually the shop moved down the block to a larger space, and two years ago a cafe was incorporated - coffee and books - the perfect combination! The shop is now managed by his daughter, Sarah Reynolds. Peter's mission to foster a better place not only led him open the bookshop but also to found the Dedham Square Circle which serves as a positive agent of change for his hometown. The goal of DSC is to bring together shopkeepers, building owners, residents and Town Hall - all working together to help make Dedham Square thrive. In 1996, Peter founded FableVision with his twin brother, Paul, an animation and graphic design studio, and another social change agency, to help create “stories that matter, stories that move.” The company is located in Boston above the Children's Museum and is highly regarded in the production of educational interactive media. Peter founded FableVision Learning, FableVision's sister company, with a dream to inspire teachers to find their own creativity and develop creativity tools for students. Today, through FableVision Learning, Peter is bringing support to school districts and classrooms around the country with professional development, custom programs and software tools. Even more recently, Peter founded The Reynolds Center for Teaching, Learning, and Creativity, a nonprofit organization (501.c3) that encourages creativity and innovation in teaching and learning. The RCTLC is dedicated to ensuring that all learners develop the vision, confidence, knowledge and skills needed to move their own lives forward, and to use their talents, strengths and energy to move their communities and the world to a better place. To donate to the Reynolds Center for TLC, please click the "donate" button below. Your contribution - at any level - helps to provide creative resources to high-need schools around the globe.